You&apos;re never far from history on the Outer Banks. 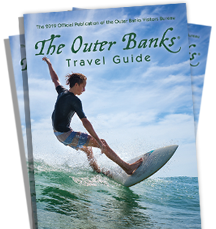 Check out these fun and interesting facts about the Outer Banks before you visit. The first English child born in the New World was Virginia Dare on August 18, 1587, at Fort Raleigh on Roanoke Island. Virginia Dare and the colonists of Fort Raleigh would become known as "The Lost Colony", their disappearance still an unsolved mystery. On December 17, 1903, two brothers, Orville and Wilbur Wright, made the first successful flights in motor-driven, heavier-than-air machines, thus ushering in the age of human flight. These historical flights took place on the sloping sands of what is now known as Big Kill Devil Hill, located just south of Kitty Hawk. The Cape Hatteras National Seashore, encompassing more than 28,000 acres along the Outer Banks, was the first to be established by our government. The purpose was to preserve this beautiful shoreline for the enjoyment of future generations. Richard Etheridge became America&apos;s first black lifesaving station keeper with his appointment to the Pea Island post in 1880. He served as keeper until his death in 1900. He was a former soldier and surfman. Dare County covers 800 square miles, comprising 391 square miles of land and 409 square miles of water. "The Lost Colony," performed at the Waterside Theater on Roanoke Island, is the oldest-running outdoor symphonic drama in the country, celebrating its 80th season in 2017. The War Between the States brought several battles to the Outer Banks. At Hatteras Inlet (August, 1861), at Chicamacomico (October 1861) and on Roanoke Island (February 1862), the Federals won their first victories of the war and established control over the Outer Banks. The inhabitants were not strongly attached to the Southern cause, and many took the oath of allegiance to the United States. The Nags Head Woods Preserve is considered one of the best remaining examples of a mid-Atlantic maritime forest, according to the Nature Conservancy organization. The habitat is made up of 640 acres of protected wetland, dune and hardwood forest and is a national natural landmark. On November 22, 1718, Edward Teach, better known as Blackbeard the pirate, was slain by Lt. Robert Maynard of the Royal Navy, in Ocracoke Inlet. The oldest and shortest lighthouse in North Carolina is the Ocracoke Lighthouse. It&apos;s the second oldest operational lighthouse in the United States. In 1902, Reginald Fessenden made the first application of a successful, commercially adaptable technique of radio communications in North America and perhaps the entire world. His experiments and invention of the wireless telegraph and telephone were made between a station located on Roanoke Island and a section station in Buxton. After leaving North Carolina, Fessenden went on to establish the first commercial Trans-Atlantic two-way radio-telegraph service in 1905, two years before the world renowned Marconi. Then, in 1906, Fessenden&apos;s station in Massachusetts broadcasted the world&apos;s first radio program for entertainment. In 1874, the U.S. Lifesaving Service was begun by building a chain of seven lifesaving stations along the Outer Banks, at the points of greatest danger to ocean going vessels. The U.S. Lifesaving Service was the forerunner to the U.S. Coast Guard. The lifesaving stations, working in conjunction with the several lighthouses located along the Outer Banks, helped to save and rescue many vessels as they passed through the "Graveyard of the Atlantic." Jockey&apos;s Ridge State Park, located in Nags Head, is the home of the highest sand dune on the East Coast with peaks at more than 90 feet.